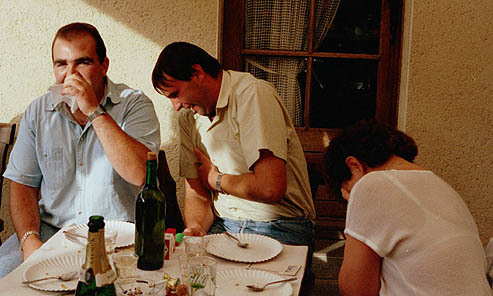 It’s well known, of course, that the French are a bunch of miserable, unfriendly sods who wouldn’t crack their faces to laugh at a joke if you paid them. Or at any rate, it’s well known to pig-ignorant little Englanders with a "foreigners begin at Calais" mentality. For the record, in the photo above, Guy is the one stuffing his hanky in his mouth, while Christophe clutches his sides and Sylviane cries tears of mirth into her handbag  all in response to a staggeringly filthy joke the details of which you’re mercifully spared as I was too drunk to commit them to memory. This was my first introduction to the people of Saligny, a small community in the Vendée in the heart of rural western France. I was staying with Bev and Graham, the boys from Bristol, in their holiday cottage in the neighbouring town of Saint Denis la Chevasse; as their guest, I’d been invited to accompany them to Sunday lunch with Sylviane and her partner Guy (a different Guy to the guy in the photo...), owners of the Bar Des Sports on the town square. Needless to say, this involved first sitting through endless rounds of drinks in the bar until it closed for the afternoon, after which we adjourned to their little patch of garden for a typically leisurely French Sunday lunch en plein air with family and friends. Graham and Bev make friends easily. They’re that sort of people. If anyone in Saligny or Saint Denis thinks there’s anything remotely scandalous about the two "single" Englishmen sharing the little cottage by the river, they keep it to themselves. A couple of days before, we’d all been invited to a wedding party in Saint Denis; pretty much any major event in the life of the community is guaranteed to carry an invitation for "les copains Anglais", and anyone staying with them (and there’s usually someone) is always welcome too. Jump forward in time two years. It’s 1994, and a sizeable group of UK friends have descended on the boys for the weekend of the August 15 public holiday. Many of the surrounding towns and villages have a festival of some sort over this weekend, and we try to cram in as many as we can since, whatever the theme, they all have certain things we like in common  eating in the open air, friendly French people, music and an endless supply of good, cheap wine. One such beanfeast  literally  is the Fete de la Mogette in La Poiré sur Vie. The mogette is a white haricot bean, a speciality of the region, and the festival celebrates the end of the harvest. As the sun goes down, the stalls and displays of the afternoon are put away and the field is set with benches and long trestle tables where we sit as it gets dark, drinking the local vin de table and eating platefuls of cooked beans with thick slices of Vendée ham and hunks of warm bread. Coloured lights fill the trees, a band is playing, and we get up to dance. It’s at this point that there’s a hint of trouble. Some young men we’ve not met before have noticed the group of somewhat merry Englishmen dancing with each other, and decided to take exception to this unselfconscious display. They come over and a couple of them start talking aggressively to one of our local friends. We don’t follow it too well, but we get the gist that it’s about us. Suddenly, there’s a crowd of the Saligny lads clustered round us, and the point is made to the strangers  forcefully but without any physical violence  that we are their friends and guests and are to be left to mind our own business. The would-be troublemakers back down and drift off, and the matter is ended. A couple of days later, it’s time for Saligny’s own big event, the Course des Brouettes  the Saligny Wheelbarrow Race. People come from all over Europe to participate in this annual competition, in which teams of four push each other round the town in decorated wheelbarrows. Prizes are given not only for the fastest teams, but for the barrows and costumes too  and some of the entrants show extraordinary inventiveness and skill in the construction of their one-wheeled vehicles. After the prize-giving, the evening follows a now familiar pattern  food, wine and a live band. It’s been a tiring few days, and I’m content simply to sit at one of the trestle tables, bask in the warmth of the friendship of those around me and drink the night away. Suddenly, one of the Saligny lads has come and perched himself on the bench opposite me and is talking nineteen to the dozen. Named Stephane, he’s a labourer, eighteen or so, with a deep tan from working outdoors and a mouth full of crooked white teeth set in a permanent grin. He asks me what I think of the band, and I nod my approval. Then he fires another question. This time, I barely caught any of it; as usual, I’m having trouble following French spoken at this breakneck speed, and in the local dialect. But he’s looking expectantly at me, waiting for an answer. I’m sure the last word was danser, but I can’t begin to guess what went before. "Pardon?" I ask. He launches into it again. I smile, awkwardly, and hold up a hand to interrupt him. "Excuse-moi, Stephane  je ne parle pas bien Français  lentement, s’il te plait, lentement!" He giggles with delight, and asks his question again, no slower than before. Again, the only word I catch is the last  danser, to dance. In the context of his previous question about the band, the only thing I imagine he might have asked is  would I like to dance? But I can’t bring myself to believe it. Instead of just saying yes and seeing where it takes me, I chicken out, afraid of the embarrassment I might cause if I’ve misunderstood. I put out a hand, palm down, and rock it from side to side as I say something like, "Peut-être  mais pas cette chanson," hoping that will get me off the hook while remaining suitably ambiguous. Stephane shrugs and gets up to leave. Then he turns, fixes me with a clear look, and  in French slow and simple enough for even me to understand  says, "When they play a song you like... come and find me." He disappears into the crowd filling the town square. I weigh up my options. Caution, the bane of my life, never got me anywhere. I down the glass of vin rouge in front of me; and, the moment the band finishes the number they’re on, I head into the throng. They’re barely two bars into the next one when I tap Stephane on the shoulder. He turns, grinning from ear to ear, eyebrows raised in mock surprise. "You like this one?" he asks. "I like this one," I say, unconvincingly. And so we danced, under the moon and the stars, and had a wonderful time. He wasn’t gay, though I’m sure he knew I was. He was just a happy teenager who saw nothing wrong in encouraging a shy stranger to get up and enjoy himself, without caring about what people might think. If I’m honest, I think the fireworks display was an hour or so later. But the way I like to remember it, they went off at that moment  exploding over our heads as we danced in the middle of a happy crowd, filling the shimmering, starlit sky with colour, and light, and  in the most literal sense possible  joie de vivre.